The Big Day is finally here. Before this newspaper hit your driveway this morning, the Super Bowl pre-game shows had probably already started. And though the talking heads in the world of sports broadcasting never seem to run out of things to say, particularly when it comes to the biggest game of the year, they hit the mother lode this time. 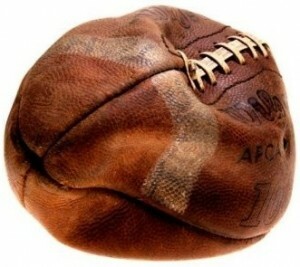 Did New England deliberately deflate their team footballs in order to give the Patriots an illegal advantage during the rainy play-off game against the Indianapolis Colts, a game where they won a lopsided victory and advanced to the Super Bowl? As I write this column, the jury is still out. And I’m too ill informed about professional football to weigh in as to what the punishment should be if the Patriots organization is found guilty. Obviously, it’s too late to not allow them to play in the Super Bowl. Talk so far is of monetary fines and draft pick-penalties. I haven’t heard a word mentioned about taking away their Vince Lombardi trophy or Super Bowl rings should they beat the Seahawks. In the midst of the 24-hour coverage of this “monumental” news event, I’ve discovered that there’s a whole lot I didn’t know about game balls. Sure, I’ve tossed a football around enough times to know that a soft football is easier to grip and throw than a hard one. But I had no idea that while on offense during a game, each team uses their own set of footballs. Which set me to thinking. Do other sports use their own set of balls during a game? Such a rule wouldn’t make sense in basketball. Offense becomes defense and defense offense so quickly and so often that trying to use two sets of balls would be not only silly but impossible. At most levels of play, the home team provides the game basketballs which, as in football, are inspected for inflation pressure before the game begins. But here’s something I didn’t know. Though Spalding is the official ball of the National Basketball Association, high schools and colleges are free to use whatever brand of basketball they wish, as long as it’s of official size and weight. Creating yet another reason why a team playing at home has an advantage over the visitors, who might be unaccustomed to the feel of a brand of ball they don’t use in their own gym. And what about baseball? No inflation issues, obviously. And only one set of game balls. In Major League baseball, the home team provides the balls, all of which are Rawlings brand and all of which are inspected and scuffed up by the umpires before play begins. Why can’t football do the same thing? Use a set of game balls provided by the home team. Let the referees check them out and then securely store them in neutral territory. No more deflation issues. Or why not change the rule to allow teams to put however much air they want in their footballs? If Tom Brady likes his footballs soft, let him play with soft footballs. If Russell Wilson prefers more air in his, let his equipment manager pump them full. But for Heaven’s sake, let’s quit treating this silliness as though it’s something of world-shattering importance. Because it just isn’t.